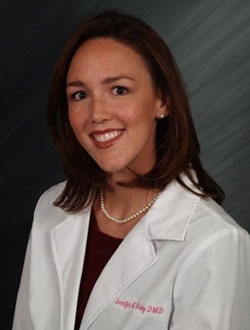 Dr. Jennifer Risley is a native of Allentown, Pennsylvania. She grew up loving the arts and athletics. In high school she was a member of the Parkland High orchestra and the girl’s golf, track and basketball teams. She excelled in basketball becoming the fourth 1,000 point scorer in school history. She was also selected to the all-conference and all-area teams. After graduating from high school in 1998 she attended Muhlenberg College and earned her bachelor’s degree in 2002. She continued her basketball career at Muhlenberg. There she was the team’s captain for three years and was also selected to the all-conference team twice. Dr. Risley then moved to Philadelphia and attended The Kornberg School of Dentistry at Temple University. After earning her Doctor of Dental Medicine degree in 2006, she returned to the Lehigh Valley and completed her General Practice Dental Residency at Lehigh Valley Hospital. She is now a member of the medical staff serving as an attending dentist. In 2007, Dr. Risley began working with her father Walter P. Risley DDS, FAGD, an Allentown Dentist for over 40 years. In 2008, Dr. Jennifer Risley purchased the practice from her father. Dr. Walter Risley continues to treat patients on a part time basis in our office. Both doctors are members of the American Dental Association, Pennsylvania Dental Association, Lehigh Valley Dental Association and the Academy of General Dentists. Dr. Jennifer Risley resides in the Lehigh Valley with her husband, daughter, two sons and dog. Together they enjoy the culture and activities of the Lehigh Valley. She also enjoys coaching little league basketball and teaching Sunday school.